Lebanon — Now that China is accepting far less recycled materials than it once did, businesses and waste processors in New England see opportunities to find new markets and make new products from the goods that formerly landed in Asia. Such was the subject of a recycling summit held at Dartmouth-Hitchcock Medical Center on Wednesday. “I actually believe that China has done us a huge favor,” said Mike Durfor, executive director of the Northeast Resource Recovery Association, during a public forum. Without the consistent market that China provided for recyclable material, the pressure will be on to come up with other ways to convert the materials — such as paper, glass and plastic — into new products. And the pressure is certainly on. The costs of recycling have risen over the past year due to the restrictions that Beijing announced to the World Trade Organization last summer. “If we don’t face this head-on and do some planning … towns are going to have to pick between hiring police officers and teachers or paying their trash bill,” Durfor said. D-H and University of Vermont Medical Center organized the forum to generate discussion in the Twin States about possible solutions. Some communities have already begun to respond. Faced with increasing costs, some New Hampshire municipalities have made changes to the way they recycle. In some cases, they’ve resorted to putting materials in the landfill that previously would have been recycled. But, Durfor noted Laconia might have acted without exploring other markets for glass that do exist. Additionally, landfills are running low on space, which also is going to drive up costs in coming years, Durfor said. Durfor estimates it will take two to five years for the markets to adjust and for waste processors to construct facilities that can manage the goods that previously were being shipped to China. But, he said, it can be done. One company that sees the changes in recycling markets as an opportunity is Circular Blu, a Massachusetts-based company that converts blue plastic sterilization wrap from hospitals into bags and pellets, which can be made into new products. Part of the solution, said Christopher Bodkin, Circular Blu’s co-founder and CEO, is to involve the original manufacturers of the products. When companies are held responsible for the products they produce, “then this problem will start cleaning itself up,” he said. Both Dartmouth-Hitchcock and the University of Vermont Medical Center are working with Circular Blu to recycle this plastic waste from operating rooms. UVM Medical Center is doing so “not just because it’s cheaper, but it’s sustainable and it makes sense,” said Jen Bergeron, the hospital’s environmental services supervisor. One of the changes implemented by China last year is stricter requirements in terms of contamination, which is when non-recyclable goods are mixed in with those that can be recycled. Contamination is a problem, said Bob Cappadona, vice president of recycling for Casella Waste Services. About one in five items that comes through Casella’s sorting plant for recyclables does not belong there, he said. Though single-stream recycling — which allows customers to put all recyclables in a single bin — is successful in reducing the amount of trash in the landfill, it has resulted in more contamination, Cappadona said. He understands that some municipalities and businesses are moving away from single sort, which he said is fine, though not always necessary. “We would support any recycling program,” he said. Creating a robust recycling industry in the region will also involve educating individuals as to what can and cannot be recycled. For example, Cappadona said that plastic grocery bags can be recycled by returning them to grocery stores. But, when they end up in Casella’s sorting facilities, they can gum up the works. At the curb in some areas, Cappadona said, workers have been inspecting each cart and leaving customers an “oops” sticker when they see an item — such as a plastic bag — that can’t be recycled that way. These stickers have proven to be the “best educational tool,” he said. Education can make a difference, said Durfor. 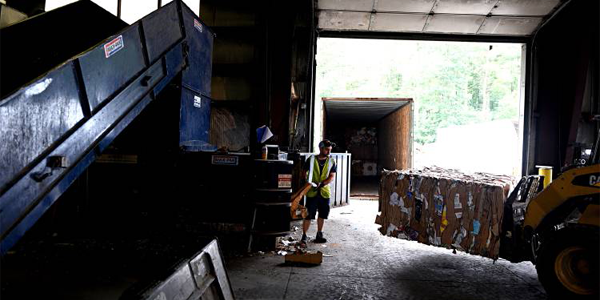 At EcoMaine in Portland, workers have been inspecting every single-sort load, and as a result of education by town administrators, the last load inspected was uncontaminated by non-recyclable items, Durfor said. “Education has become huge,” he said. Some the dozens of members of the audience asked whether efforts are afoot to reduce the amount of waste that is created. Pat McGovern pointed out that only one of the speakers had brought his own water bottle, and the others were drinking from plastic, single-use vessels. Perhaps the increased recycling costs will draw attention to the problem and push manufacturers to make changes, Bodkin said.